This site is a self indulgence for me, it’s a creative outlet where I can talk about what I love. But there’s a certain genre that I don’t really talk about on here despite it being my favourite, fighting games. Twice a week I meet a friend of mine to play Street Fighter V, on occasion we’ll veer into other fighters like Skull Girls et al but Street Fighter V (and 4 before that) Have been our bread and butter for years. I’ve been to Japan a couple of times over the past couple of years and spend a large amount of time in the arcades with my wife playing fighting games and just seeing what’s going on. As would be no surprise to anyone in the west Anime Fighters are huge there and games like Blaz Blue, Fighting Climax and Under Night In-Birth garner quite a crowd. As someone who enjoys fighting games and anime I feel like these should be my mainline but try as I might the mechanic heavy games always eluded me on a casual level. Thanks to this review I decided to lean heavy on actually understanding an Anime Fighter. UNDER NIGHT IN-BIRTH Exe:Late[st] follows in the grand tradition of Anime Fighters having insane names that border on parody. 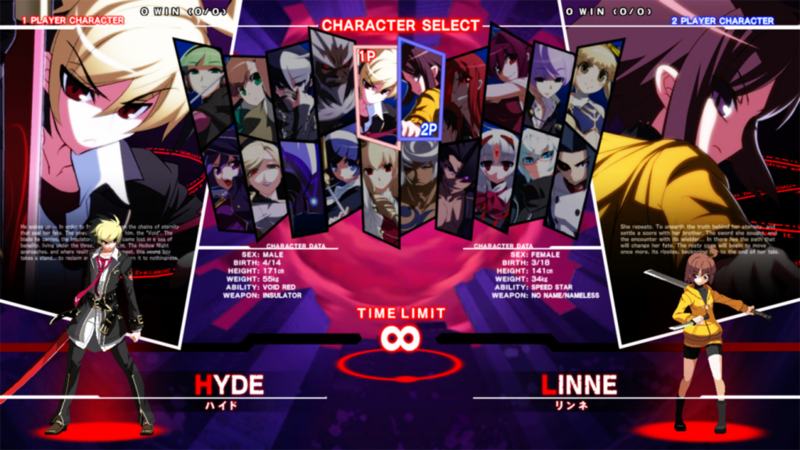 This is the latest revision of Under Night In-Birth featuring various fixes and balance changes across the board, that being said, someone who’s new to the sub-genre may struggle to notice the nuances a true fan would. 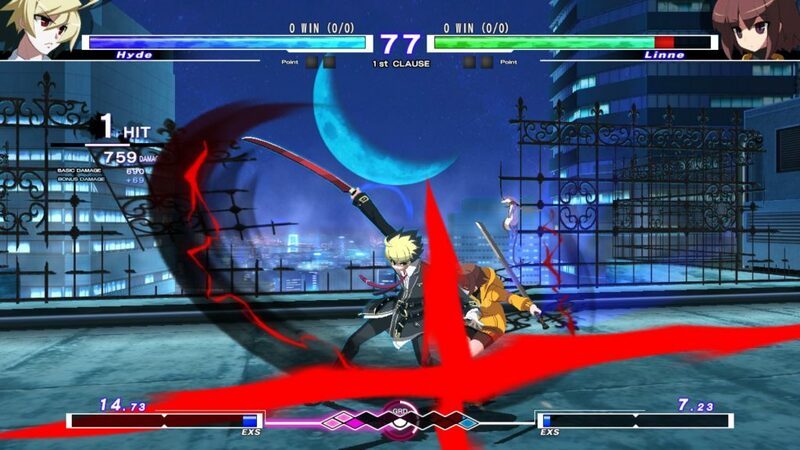 From an outside perspective I can say that UNDER NIGHT IN-BIRTH Exe:Late[st] is simply a great fighting game. With 20 characters up front you have all bases covered with your anime school girls, your evil looking old men, your militarised women and your pseudo demon women who are very comfortable in their lack of clothing. The story mode features a light visual novel style with Japanese voice acting and it’s pretty much what you would expect; few frames explaining character motivation (though these assume some prior knowledge of story), 5 fights before a mid boss with more story, few more fights before you meet big boss with accompanying story to wrap it all up before the credits role. This won’t tax most people with a basic skill in fighting games, the game doesn’t reward button mashing but I imagine most will get by with it if required. Where the game excels is in it’s strategy. Some fighting games are designed to play defensively, namely Street Fighter, you block and hide in a corner and wait for your opponent to make a mistake before you follow up with your killer punish combo. 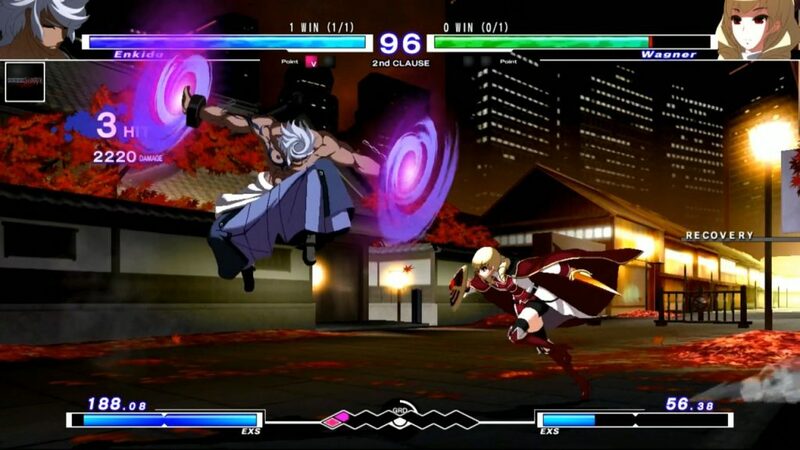 And while UNDER NIGHT IN-BIRTH Exe:Late[st] does play well with this style you’re more encouraged to play a different tactic, there’s a lot more reward for you going in aggressive, even if you are just doing footsie and playing the low ground game. On the face of it you’ll feel like each character only has a couple of moves with the usual fighting game down forward punch variations but once you get into the truly impressive 179 lessons in the tutorial or just glance at the command list in the pause menu you’ll realise that those moves are just the start of things. A large number of the character’s move sets are based around the idea of chaining, do one move to then be able to do another. This is one of many areas that new players may struggle with initially but given time and some playing in the tutorial area everyone can pick it up. I mentioned the push towards being aggressive and this is mainly down to a fascinating concept called the grid. At the bottom of the screen between each player’s individual meter is a shared meter that fills up either when a player holds down the concentrate button, leaving them wide open for a flurry of attacks from their opponent, or more advisably it fills when a player pushes with attacks and gets combos going. Once it’s reached a certain point a button combination will allow the player to pull off their typically over the top flashy special moves. It’s a clever way to keep the action moving and rewarding players for not just sitting back and waiting the timer out. All of the various game modes you would hope to find in a modern fighting game are present with story and challenge type areas filled out and the obvious multiplayer. 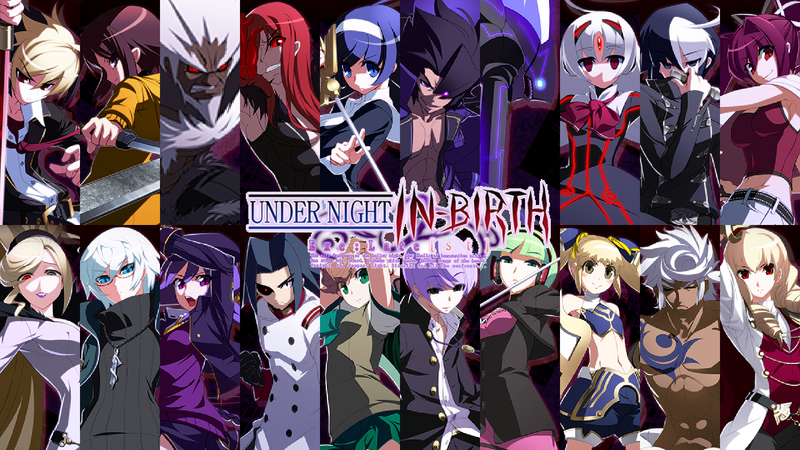 Unfortunately finding an online game is a little bit of a struggle currently and if you do get into a game you may find that the lag is a little uncomfortable for the majority, the other issue is that this is the third version of Under Night In-Birth and at this stage if you get in a game online you’ll be realistically taking on people who play the game religiously and have no issue showing you. This isn’t by any means a slight against the game, it’s impressive to see what a top level player can do, but it’s just a shame it comes at the cost of a few minutes of your time and a large chunk of your pride. Something I’m not sure people are praising enough is the character select screen that launches with an animation of the character tiles falling into places with accompanying music, it’s worth the price of admission alone. On top of that the soundtrack is filled with awesome epic music with hints of classical pieces dropped in for good measure. The backgrounds lack some of the quality I’ve come to expect from my fighting games and is particularly jarring for being slightly barren polygonal areas that don’t match the art style of the characters up front. Some are great simple stages like the street fight under a highway or the dockland area but others like the shopping centre just have no life to them which is quite unfortunate. With it’s large array of characters covering all standards of player from the zoners to the grapplers to the people who love mechanics on their mechanics and want to control not only their player but a summoned creature from another dimension you’ll be sure to find someone that is going to be your main. Fight sticks are a must for this game and to be honest as with any fighting game the most fun you’ll have is actually with a friend on the couch next to you. 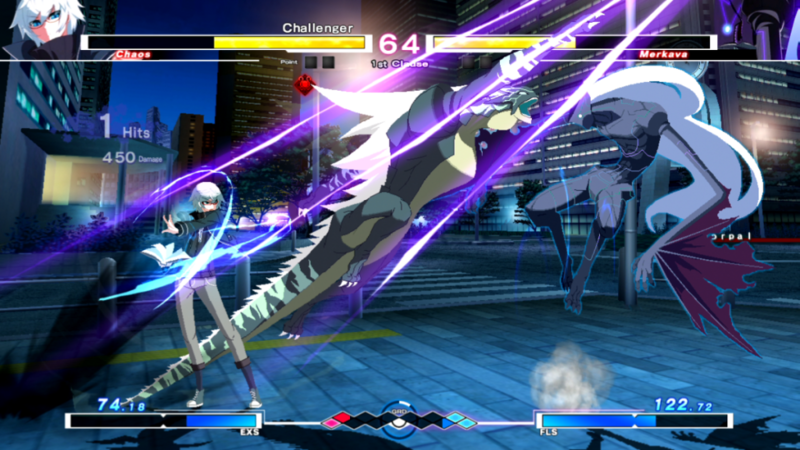 There’s a lot to love about UNDER NIGHT IN-BIRTH Exe:Late[st] and with it’s truly awesome character art and music you’ll be hard pushed to be displeased with local play, it just may be a tough sell if you’re looking for a long term online experience.